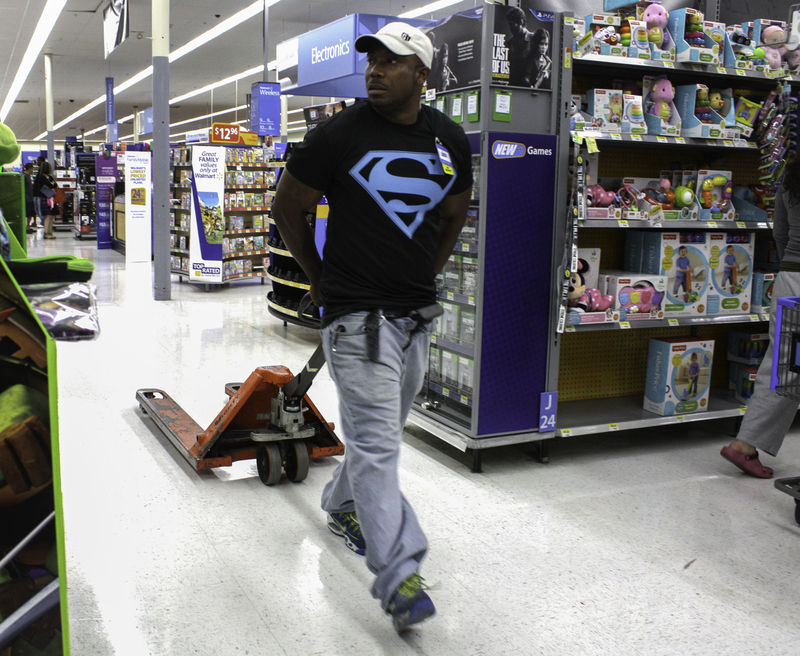 At 33, Darryl Randle wishes he didn’t have to live with his family, but his job at Walmart doesn’t pay enough for him to live on his own—something that is unlikely to change even with a jump to $9 an hour in the state’s minimum wage. An unloader at the discount retailer’s San Lorenzo store, Randle moves heavy materials and sorts them. He describes it as the most demanding job at the store. After watching upbeat videos during his training, Randle looked forward to a rewarding job. Now the link on the company’s website that says, “Learn more about why our associates love working at Walmart,” makes him laugh. He takes BART to work from Oakland, where he lives with his grandmother and sister. The trip takes about an hour and a half. “But when I work a night shift, it takes me about two and a half hours to get home,” he said. Randle works at least 30 hours a week but never quite enough to qualify as full time, so he doesn’t get health coverage—a common complaint of Walmart employees. The company offers leaves of absence — in theory. The reality is, they are almost impossible to take. And taking one can be considered a count towards termination. “The only benefit I get is a 10 percent discount,” Randle said. They aim to secure benefits, excused absences and paid time off for part-time employees. Already, they’ve forced the retail giant to accommodate pregnant workers instead of forcing them into unpaid leaves.